When I moved out to Calgary for a year, one thing I was looking forward to doing was visiting the province of Saskatchewan. In 2010, I had been to 9 provinces, and Saskatchewan remained as the sole province I had not been to (I still have not been to any of the Territorties...). I decided to take advantage of an okay seat sale on Air Canada and WestJet and go to Saskatoon for a weekend. I picked the first weekend in October, as there were a few hockey games to catch, and I figured the weather would be good for walking around. I arrived at YYC early for my flight to YXE as I wanted to use one of my lounge certificates. I earned Prestige status from Air Canada in 2009, yet hadn't used any of my certificates. Although it was too early for alcohol, I did enjoy the atmosphere in the Maple Leaf Lounge. My flight in a CRJ-200 to Saskatoon was nothing particularly interesting. It left on time, and arrived on time, which is really all you can ask of an hour long regional flight. I was quite excited leaving the plane because i) I had to use the bathroom and ii) I had checked off my tenth province. I rented a car for the weekend (a Hyundai Elantra), made my way into the downtown core. I parked in a pay lot near the mall downtown, and went for a stroll. It was quite windy, but temperatures were fine, around 16 degrees. The parkland along the North Saskatchewan River is very nice, and it was a pleasurable stroll. I poked around some of the downtown shops, and bought a couple of books at a used book store. I had a food court lunch at the aforementioned mall. One thing that struck me was everyone seemed to have a piece of Roughriders gear on. The Green Riders were playing that day, but on the road, and the team plays out of Regina... They have themselves a cult following (not in the way a movie has a cult following, but more literal...). Anyhow, I visited the Western Development Museum after lunch. It is a nice museum. I had visited Heritage Park in Calgary not much earlier, and I found the two to be pretty similar. I went North, checked in at the glamorous Motel 6 near Credit Union Centre, and made my way to my first hockey game of the trip. I saw one and a half Junior B games in Saskatoon. The first was a match-up between the Ochapowace Thunder and the Saskatoon Quakers, at the Harold Latrace Arena in Southwest Saskatoon. Ochapowace was the better team, and I had to leave early, but the Thunder won with ease. I was excited to go to the Credit Union Centre. It is a big arena for junior hockey, seating over 15,000. 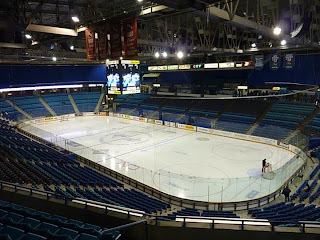 The hometown Blades were playing the cross-Saskatchewan rival Regina Pats. The crowd was a bit thin, but it was early in the season. The Blades had a good regular season in 2010-2011, and they had little trouble with the Pats. I had a seat in the upper bowl on the blueline, and had a nice angle for the game. I would love to see a game there with the joint packed. The Memorial Cup should be a lot of fun there in 2013. On Sunday morning, I went on "Prairie Drive 2010". I drove a triangle route from Saskatoon west to Biggar, south to Rosetown and Northeast back to Toon Town. I was surprised that it was not all flat, like I would later experience in Southern Saskatchewan. The terrain was very interesting. Biggar is a neat little town, with the slogan "New York is big, but this is Biggar." Really, that slogan, and being the hometown of Sandra Schmirler (the great curler) are the town claims to fame. Forty-five minutes south is Rosetown, which is a bit bigger, and has a very wide main street. I had a hot hamburger sandwich for lunch (it seemed like a good small town meal). Once back in Saskatoon I caught another game at the Latrace Arena, this time between the Saskatoon Royals and the Southern Rebels. I was quite impressed with the calibre of the Prairie Junior Hockey League. It isn't as good as the Nova Scotia Junior Hockey League, but I am biased. Quickly departing the arena, I made the ten minute drive back to Saskatoon Airport. My flight was scheduled for 9:00 pm-ish, and I arrived at around 8:00 pm. Note to future travellers from Saskatoon – if arriving for an evening flight, I suggest that you arrive having eaten. The canteen shuts down at 8:00. I took WestJet back to Calgary, and the inbound was about an hour late arriving. It is awfully frustrating when the flight scheduled to leave after you boards and departs before your plane arrives. Oh well, I did get a personal best in 'Nature Park', the Tetris like game on my cell phone... Our flight was doing a point-to-point journey, and had originated in Ottawa, stopped in Toronto, came to Saskatoon, on to Calgary, and I think was on to Kelowna or Abbotsford afterwards. There was a good load on board. Everyone on board just wanted to get to Calgary, and the flight itself was fine. I enjoyed my visit to Saskatoon. I found while living out that I didn't really like a lot of places, but I liked Saskatoon. It seemed like a very livable city. Credit Union Place is a nice arena, and would be a great place to see a game when it has over 5,000 in attendance. The PJHL has a nice brand of hockey. Air Canada Jazz provided a smooth trip Northeast, whilst I was less impressed with the late WestJet arrival/departure.